Image caption Japan says China locked radar on its ship - something PM Abe called "dangerous"
China's Defence Ministry has denied Japanese allegations that its navy ships twice put a radar lock on Japanese military vessels last month. Japan's remarks "were against the facts", a statement on its website read. On neither occasion cited by the Japanese side had the Chinese vessel used its fire-control radar, it said. 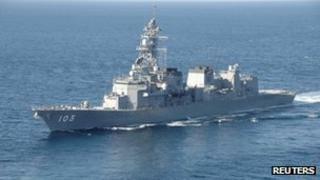 It urged Japan to "stop stirring up tension in the East China Sea". Japan said the Chinese explanation did not match the facts. The two nations are embroiled in a bitter territorial row over East China Sea islands, called Senkaku in Japan and Diaoyu in China. Japan controls the islands, which are also claimed by Taiwan. The situation is certainly the most serious for Sino-Japanese relations in the post-war period in terms of the risk of militarised conflict. The two sides have had periodic deteriorations in bilateral ties before and usually found a way to settle if not resolve differences. There are mechanisms to defuse tensions somewhat but there is also perhaps a lack of leadership on both sides necessary to really focus on dealing with the problems. We are seeing the coincidence of two regimes in China and Japan which are facing crises of legitimacy and a temptation to turn to issues of nationalism to compensate. The problems of the legitimacy of the Chinese Communist Party in trying to maintain one party rule in the face of pluralist pressures are well known. Japan is a democracy so does not face quite the same pressures, but there is a similar sense of the bankruptcy of the legitimacy and competency of the governing elites, and all of this is set against a difficult economic climate. Since the row reignited in September 2012, Chinese vessels have been sailing in and out of what Japan says are its territorial waters around the islands, prompting warnings from Tokyo. Earlier this week, Japan's Defence Minister Itsunori Onodera said a Chinese navy frigate close to the islands had locked its weapon-targeting radar on a Japanese navy ship on 30 January. The Chinese Defence Ministry, in its statement, said that in each incident, the Chinese vessel "kept normal observation and alert, and fire control radar was not used". "China hopes that Japan take effective measures to stop stirring up tension in the East China Sea and making irresponsible remarks," it said. The Japanese foreign minister dismissed the denial, which he said the Defence Ministry had made to the Japanese embassy in Beijing on Thursday. He said the explanation from the Chinese side "does not conform to the facts and is completely unacceptable, and I have responded to them as such".